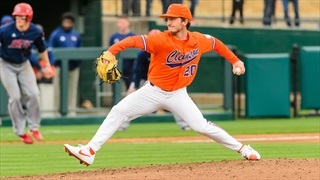 Freshman righthander Jackson Lindley tossed a career-long 5.2 innings to lead Clemson to a 7-4 victory over Tennessee Tech at Doug Kingsmore on Wednesday night. 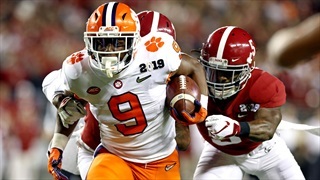 Running back Tavien Feaster has entered the NCAA transfer portal and intends to transfer from Clemson University, Head Coach Dabo Swinney confirmed on Wednesday. 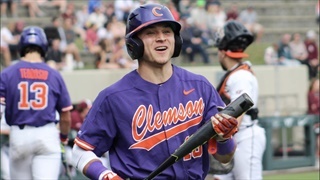 Alex Raines' two-run single in the seventh inning gave Winthrop the lead in its 8-6 victory over Clemson at Doug Kingsmore Stadium on Tuesday night. Matt Mervis' leadoff homer in the ninth inning lifted Duke to a 9-8 win over No. 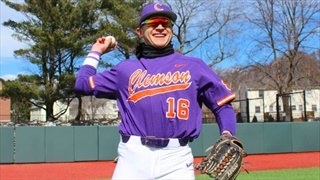 16 Clemson at Doug Kingsmore Stadium on Sunday afternoon. 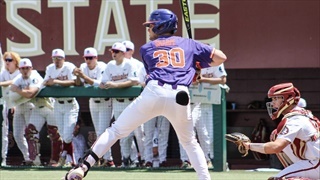 Clemson will look to end their recent losing streak as Duke heads into Doug Kingsmore Stadium this weekend. Jacob Hennessy and Brooks Crawford combined to pitch a two-hit shutout in No. 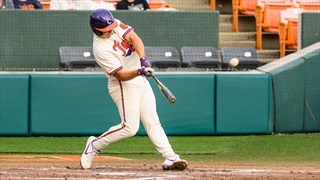 13 Clemson's 2-0 victory over Furman at Doug Kingsmore Stadium on Wednesday night. 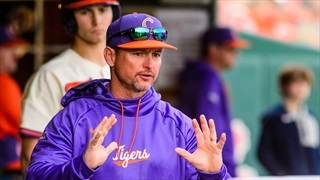 Due to forecasted inclement weather, the scheduled game between Charleston Southern and Clemson on Tuesday at 6 p.m., at Doug Kingsmore Stadium was canceled. 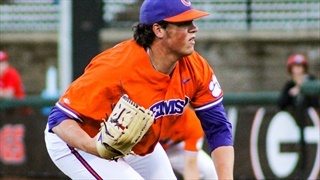 Charleston Southern and a more recent opponent are on the docket for Clemson baseball over the next two days. Sophomore lefthander Mat Clark allowed just one run on four hits in a career-long 7.1 innings pitched to lead No. 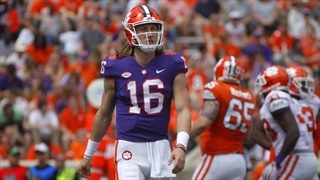 13 Clemson to a 6-3 victory over No. 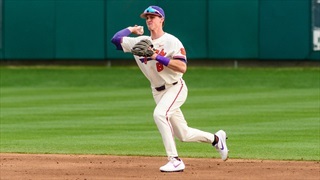 8 Louisville at Doug Kingsmore Stadium on Saturday. 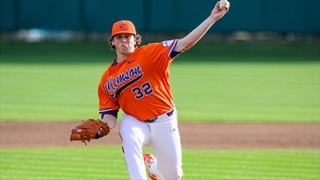 Junior righthander Tim Elliott tossed 7.1 strong innings to lead No. 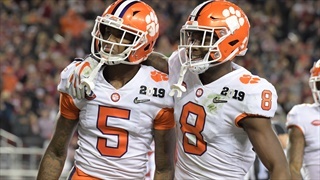 4 Georgia to a 5-3 victory over No. 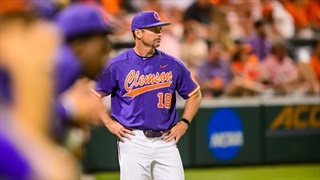 13 Clemson at Doug Kingsmore Stadium on Tuesday night. 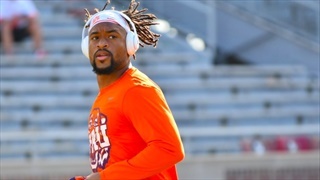 One day back from spring break, the reigning national champions are dealt a blow at wide receiver. Mason Pelio pitched 6.2 strong innings to lead Boston College to a 3-2 victory over No. 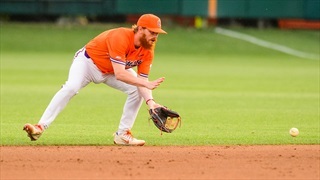 20 Clemson at Harrington Athletics Village on Sunday afternoon. No. 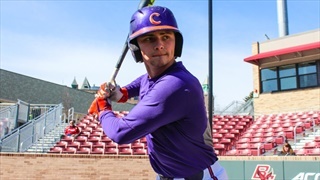 20 Clemson jumped out to a 5-0 lead behind six extra-base hits in the first three innings and held on for a 9-5 victory over Boston College at Harrington Athletics Village on Saturday afternoon. Six Tiger pitchers combined to allow just one run on seven hits in No. 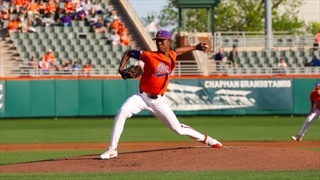 20 Clemson's 4-1 victory over College of Charleston at Segra Park on Wednesday night.